This year marks the 20th Anniversary of the public release of Spring Drive with the first models being released to the market in 1999. To commemorate the anniversary Grand Seiko has released two new hand winding calibres each with a pair of watches available. The first new calibre is the 9R02 that is created by the Micro Artist Studio. The Micro Artist Studio is best known for their work on high-end Credor models like the Eichi and Eichi II but they also created their first Grand Seiko model in 2016. This was the 9R01 powered 8-Day Power Reserve Spring Drive. The new 9R02 calibre is finished with the same level of precision we have come to expect from the Micro Artist Studio. The edges of the bridges and the screw holes are highly polished along with the jewels and blued screws. 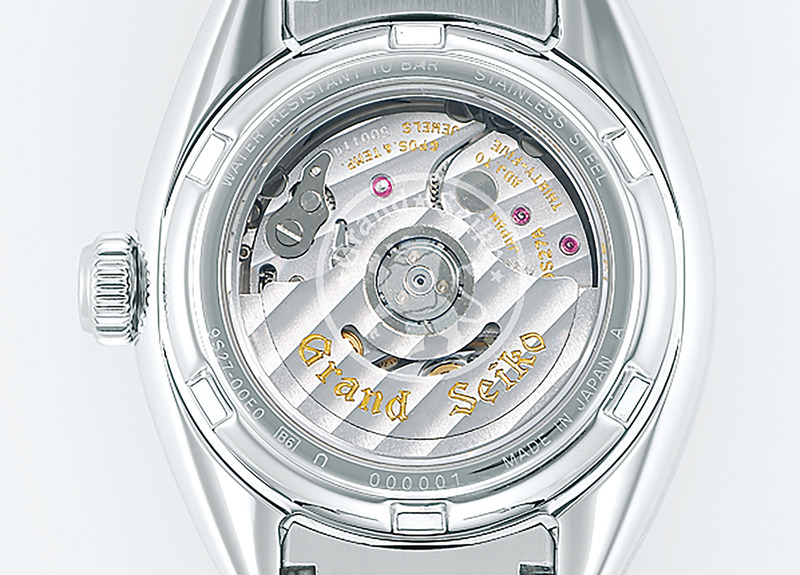 Unlike the 9R01 which featured three separate mainspring barrels that sequentially operated to provide the 8-Day power reserve the new 9R02 has a single barrel. The unique feature of the barrel is that it contains two mainsprings set in parallel and it uses a Torque Return System to deliver a power reserve of 84 hours (3.5 days). The Torque Return System operates for the first 48 hours of the power reserve and allows the excess power available when the mainspring is fully wound to be returned to the movement and rewind the second mainspring. The cover of the mainspring barrel features a shaped pattern representing a bellflower that is the symbol of Shiojiri where the studio is located. Engraved into the mainplate is the symbol for the Micro Artist Studio. To confirm the remaining power reserve you are able to check a power reserve meter, visible through a sapphire crystal, located on the rear of the movement. Placing the power reserve display on the rear leaves the dial side with a simple clean three hand design. The 9R02 calibre is featured in two new models announced at Baselworld. The first is the SBGZ001 that houses the movement in a distinctive 9.8mm thick platinum 950 case. The case has a hand carved pattern representing the Snowflake finish inspired by the snow in the Shinshu region. 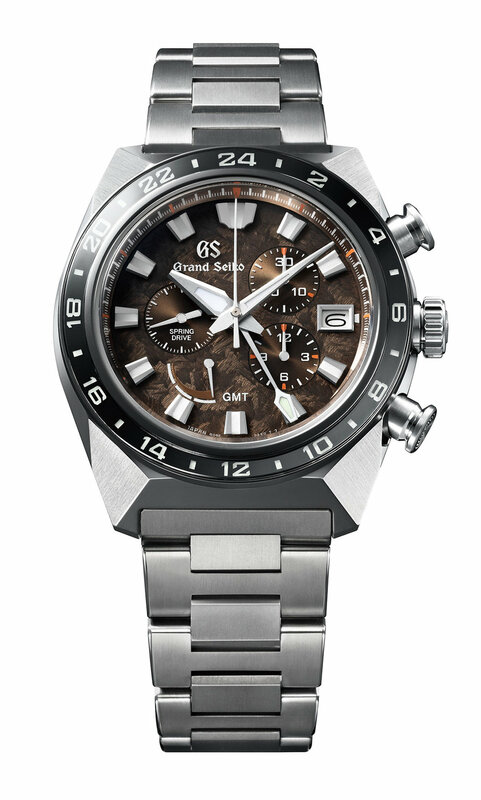 This pattern is repeated on the dial that features the GS logo, name and individual minute markers etched into the surface. Visible through the display back is an 18k gold plaque set on the lower bridge that has the words “Micro Artist” engraved but this can be changed to the owners name if they wish. This model will be a limited edition of 30 units available worldwide. The second model to feature the 9R02 movement is the SBGZ003 that also has a platinum case but instead has a plain finish compared to the textured finish on the SBGZ001. 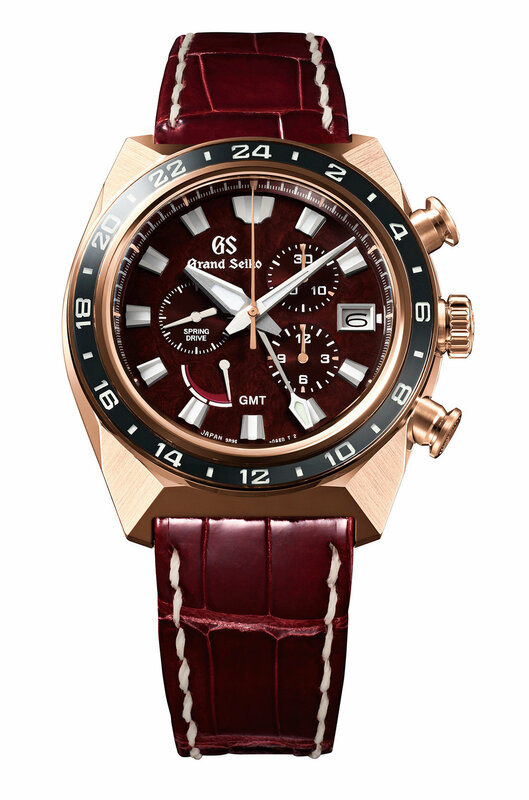 The SBGZ003 dial shares the etched GS logo, Grand Seiko text and minute markers. This model is not a limited edition and will be an ongoing standard model in the range. The second new hand wound Spring Drive movement is the 9R31. This movement is made in the Shinshu Watch Studio that is in the same facility of the Micro Artist Studio. The 9R31 features the same dual mainspring barrel as the 9R02 but is lacking the torque return system resulting in a reduced power reserve of 72 hours. The movement also has a rear power reserve indicator. The new 9R31 movement is provided in two different models. The first is the SBGY002 that houses the movement in a10.2mm thick 18K gold case and features a snowflake finished dial. This is also a standard line up model and is not a limited edition. The second 9R31 based model is the SBGY003 that features a 10.2mm thick stainless steel case and a sunray patterned dial. This model is a limited edition of 700 units. These four new hand winding Spring Drive models will be available worldwide from July. The next group of releases celebrating the 20th Anniversary of Spring Drive come from the Grand Seiko Sport range. There is a totally new case design that is being introduced with three new models. The new distinctive styled case has highly angular faceted sides and a sapphire bezel. The dials feature newly designed hands and markers and are placed behind a dual domed sapphire crystal. The hands, hour markers and bezel are all lumed. Two of the models are GMT chronographs that feature large concave pushers to ensure the users finger does not slip during operation. 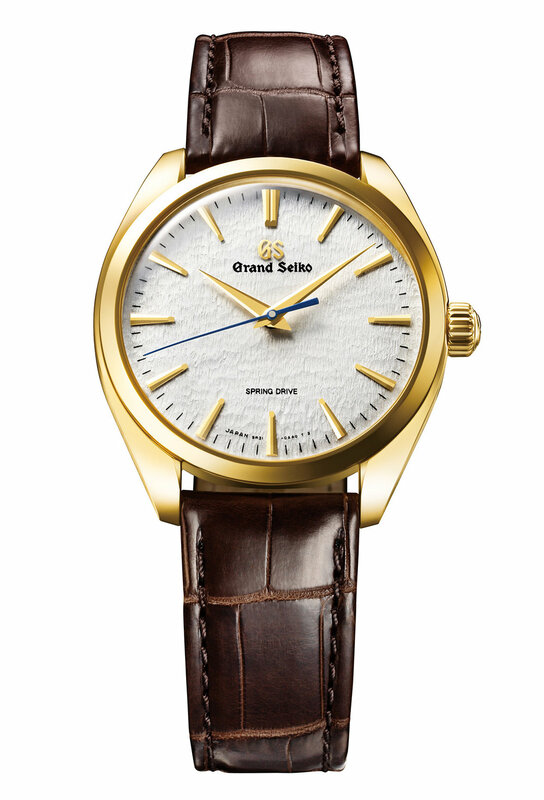 Each model has a textured dial that according to Grand Seiko is styled after the lions mane. The three models will have a phased release schedule starting in May. 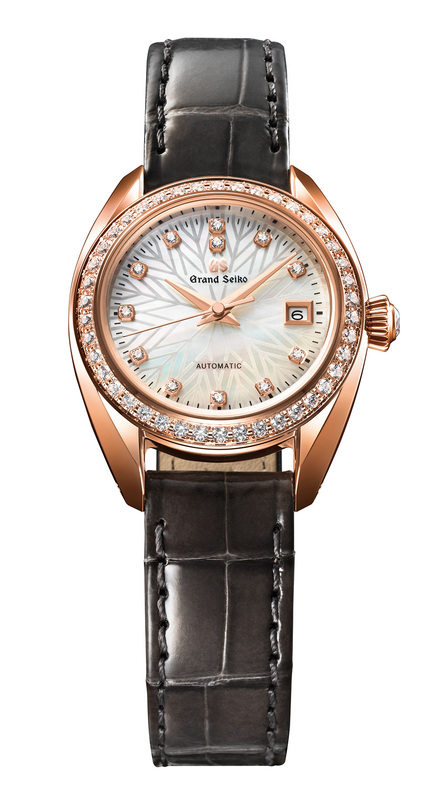 The first model in the range is the SBGC230 that has an 18K rose gold case with red dial and black bezel. Powering the model is a specially adjusted 9R96 chronograph movement at is rated at ±0.5 seconds per day. 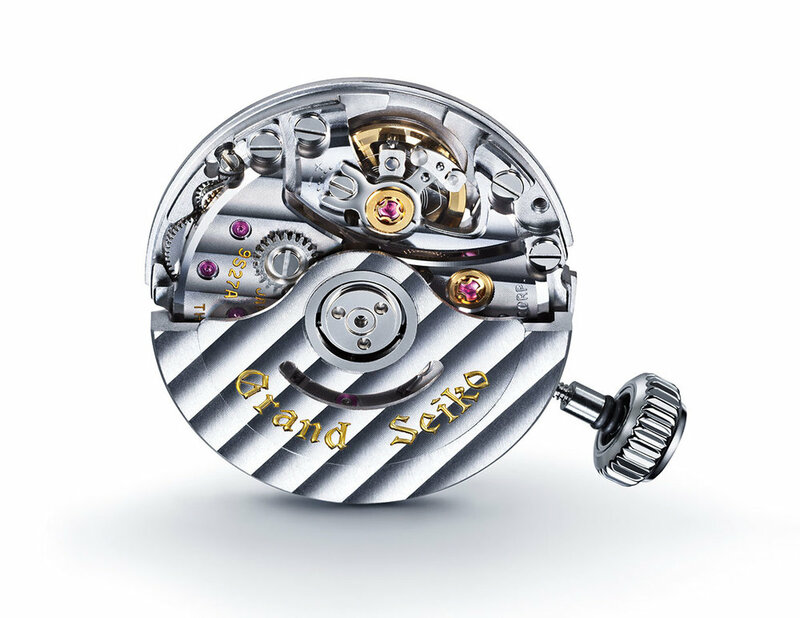 The next model is the SBGC231 that houses the same specially adjusted 9R96 movement in a high intensity titanium case. It has the same textured pattern to the dial but on this model the dial is a brown colour. This model is supplied with a titanium H link bracelet compared to the crocodile strap found on the SBGC230. The final new addition to the Grand Seiko Sports collection is the SBGA403 standard three handed model. This watch houses a specially adjusted 9R15 movement that has been adjusted to ±0.5 seconds per day. The same brown textured dial finish seen on the SBGC231 is also present on this watch, but as it does not have the GMT or chronograph functions the dial is a much cleaner layout with just the date and power reserve indicator breaking up the dial. This new case design is very distinctive and I am sure will be quite polarising with fans of the Grand Seiko brand. When I initially saw the design of the new case from the front I was instantly reminded of the angular case from the Seiko Lord Matic 56LMW 040 (5606-7000) from the 1970’s. This was a very popular model with numerous examples still seen today but it was considerably smaller at 34.5mm in diameter and 10.0mm thick. The new Grand Seiko Sports models are much larger at 44.5mm in diameter and the side profile makes it clear that there is few similarities other than an initial impression when compared to the LM case. It is difficult to judge the model from the renders that were initially provided by Seiko so I will wait until seeing pieces in person before making up my mind on these pieces. 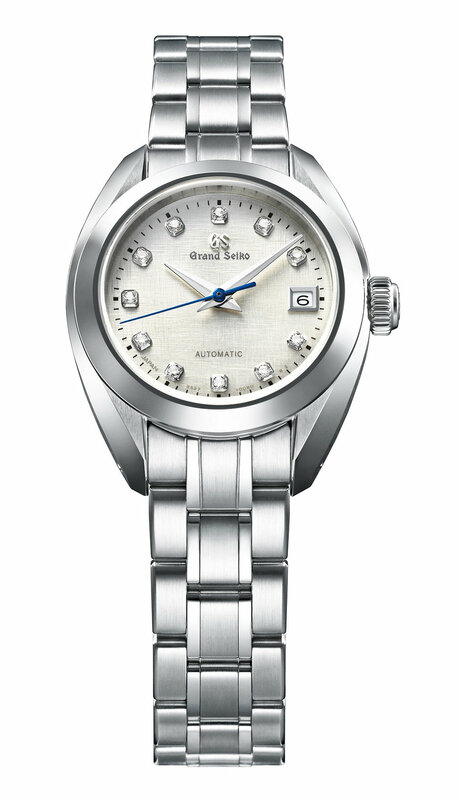 The last of the Grand Seiko models introduced were a new range of ladies models. These are all based around the new 9S27 movement. The 8 beat automatic movement is rated at +8 / -3 seconds per day with a 50 hour power reserve and measures just 19.4mm in diameter and 4.49mm thick. By utilizing the MEMS engineering process the escapement wheel is designed in the shape of a five petal flower. 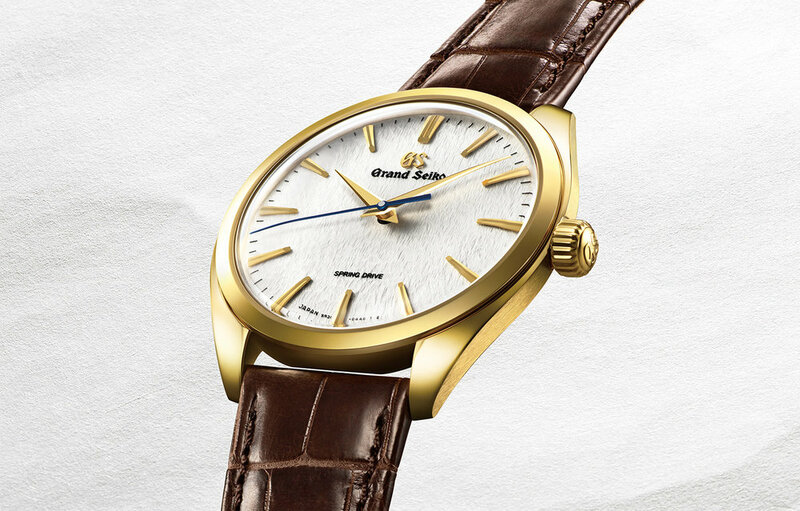 Just like the other Grand Seiko mechanical watches these models are made, assembled and adjusted by hand in the Shizukuishi Watch Studio and undergo the standard rigorous 17 day testing procedure. This movement looks to be extremely similar to the 9S25 that was released last year with the same number of jewels, power reserve and dimensions. The one obvious difference is the finishing pattern. Personally I prefer the blued screws and red text found on the 9S25 but this is a matter of personal taste. The new movement is used in five new models all available from June. The first model is the Zaratsu polished stainless steel cased STGK007 with a champagne linen dial, eleven diamond markers and a blued seconds hand. 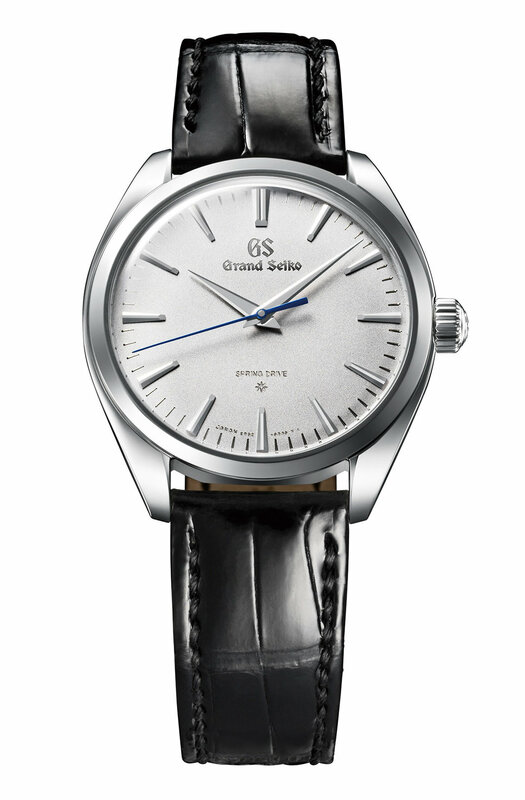 The second stainless steel cased model, STGK009, has the same Zaratsu polished case and blued seconds hand but features a mother of pearl dial with baton hour markers. The next three models are essentially the same but have different coloured 18K gold cases. The STGK003 is white gold, the STGK004 used yellow gold and the STGK006 is rose gold. 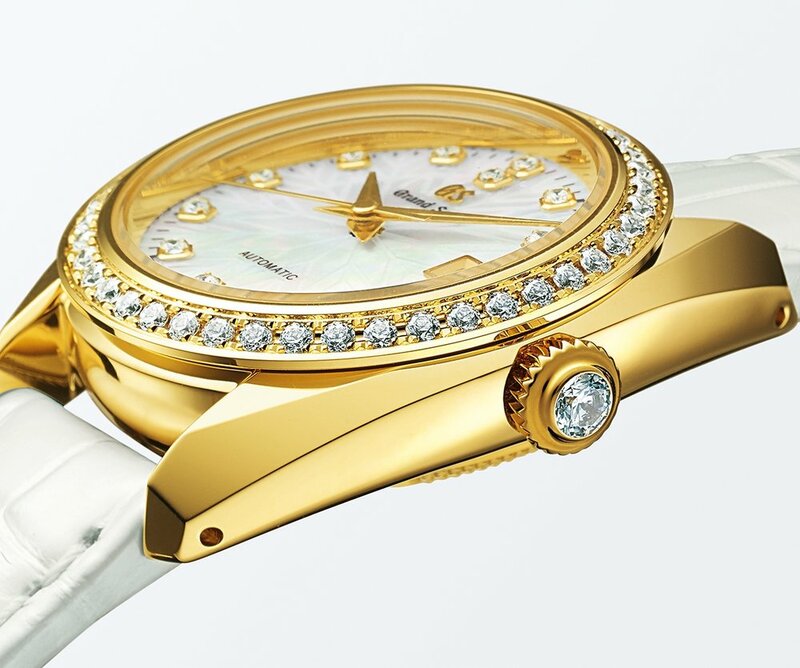 Each model features forty two diamonds around the bezel and twelve diamonds on the dial. 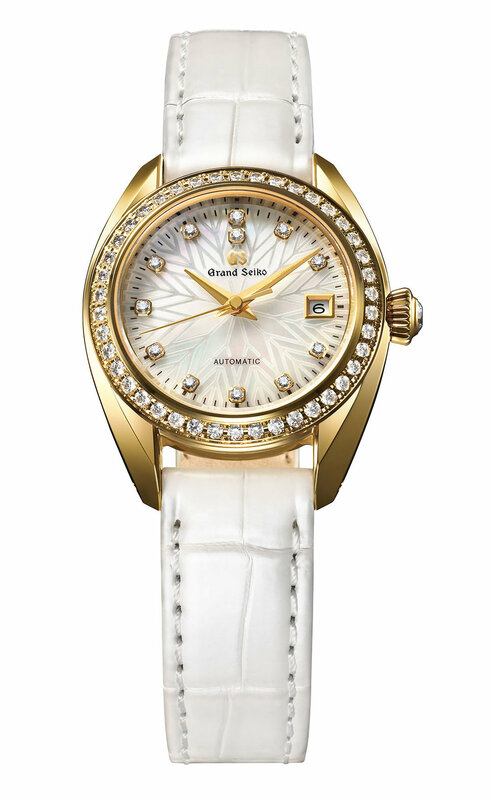 The mother of pearl dial has a pattern carved into it. My favourite model from these new models is the plain STGK009 with no diamonds. I think this model would be the most practical for everyday wear and would be the most flexible when coordinating with different clothing. 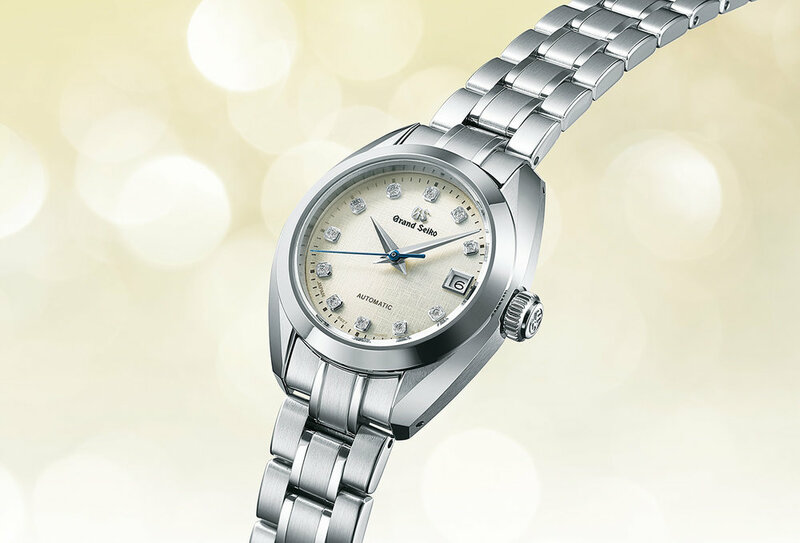 It is nice to see the range of ladies Grand Seiko models expanding and I am sure these models will find a receptive audience, but it would be nice to see further expansion into larger models up to around 35mm. From this years Basel releases the hand wound Spring Drive models appeal the most to me and I applaud the shift of the power reserve indicator to the rear of the movement as this allows for a much cleaner and simpler dial design. Note: Prices listed are recommended retail and different taxes and duties apply in disparate regions so pricing will differ.